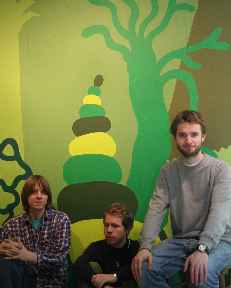 Yokoland is a Oslo-based designerstudio established by Aslak Gurholt Rønsen and Espen Friberg sometime between 2000 and 2005. The studio has done designs for the Metronomicon Audio label and for the publisher Flamme Forlag. They have also done work for The New York Times Magazine, Domino Recording Company, The Notwist, Human Empire, Henie-Onstad Kunstsenter og Carl’s Cars. In 2006 a book, "Yokoland – As we go up, we go down", was released on Die Gestalten Verlag in Germany.